Pancha Mahapurusha Yoga is the five important planetary combinations in Hindu astrology. 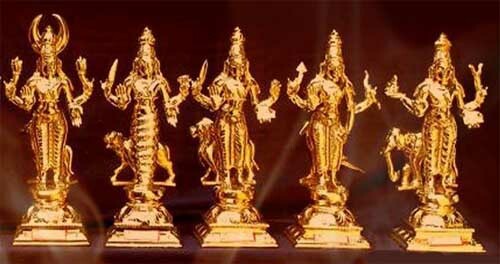 They are ruchaka, bhadra, hamsa, malavya, and sasa. If in the horoscope or janam kundali of a person, Mars (Mangal), Mercury (Budha), Jupiter (Guru), Venus (Shukra) or Saturn (Shani) occupy a Kendra house (quadrant or house I, IV, VII or X), which is its own house, exaltation sign or mulatrikona sign, the resulting yoga is called Pancha Mahapurusha Yoga. The effects of Pancha Mahapurusha Yoga are very good. Varahamihira’s Brihat Samhita deals with these five combinations. The planet to be effective should be de facto strong and not weak by debilitation, association or aspect. These five yogas may be counted from the ascendant or the moon’s place. Ruchaka yoga is made by Mars and therefore makes a person famous and wealthy. The person having this yoga in horoscope will be a leader. He will occupy high position and lead people. People with this yoga can become entrepreneurs, mangers, CEOs etc. Bhadra Yoga is caused by Mercury and makes one an intellectual with an impressive personality and long life. People with this yoga can become celebrities or politicians etc. This yoga happens in a horoscope when Jupiter occupies a Kendra house. The person in the yoga will attract others physically. The person will be of pure mind and of righteous conduct. The person will have a high moral character with a pleasing temper. The person will make in life through good personality. The person will have a spiritual outlook to life. Malavya Yoga is associated with Venus in house I, IV, VII or X in the horoscope. The person with the yoga will have a good physical strength, happy family life, power, knowledge and good wealth. The person with the Yoga will be inclined towards material welfare, comforts, pleasure etc. Sasa Yoga is the result of Saturn or Shani in the Kendra house. People with this yoga will do well in politics. Such people will also get high position in government jobs. But this yoga will unleash evil in the person. Such people will be jealous and greedy for other people’s wealth. They will show wickedness, cruelty, meanness, sinful character etc. They will also have good qualities but that will be covered by the bad qualities.